With cannabis legalization on the horizon, many Canadians are concerned about whether the roads will remain safe with this new wave of recreational drug users. Society is all too familiar with how much alcohol is safe to consume before getting behind a wheel, but how does this translate to pot? One beer is usually okay before getting on the road, but is one joint okay? One puff even? If you have ever pondered this, you are not the only one. The fact is that nobody really knows how much cannabis is a safe amount. The science is inconclusive, yet the laws have already been set in stone to put cannabis users behind bars if they smoke too much before driving. Experts, police, and Canadian citizens alike have no clue how much cannabis is an acceptable amount to have in your system while behind the wheel. According to a Health Canada survey released last year, 39 per cent of cannabis users drove within two hours of consuming pot. Half of cannabis users didn’t feel that its use affected their ability to drive at all. RCMP Constable Ryan Dunn was questioned about how much cannabis is safe when it comes to driving early this year at a city council meeting in Kelowna, B.C. “When I think about cannabis, I really, truly have no idea,” said Dunn. Dunn’s answer is the reflection of many other law enforcement officials and cannabis experts across Canada. Legalization is approaching fast, and Canadiens are being left in the dark when it comes to cannabis and driving. While laws are set in place, Canada is a testing ground for recreational cannabis use, and Canadians are the guinea pigs. Laws and regulations are bound to change while new information is brought to the forefront, but Canadians who intend to consume cannabis recreationally or medicinally will have to tread lightly until more conclusive evidence is revealed. Among this particular widespread confusion, another question troubles Canadians. Does cannabis affect user’s ability to drive safely? While you may answer yes confidently, the answer is not all that simple for most. A Public Canada Safety study shows that 28 per cent of cannabis users haven driven while under the influence of cannabis. Among these cannabis users, 4 in 10 downplayed the risks of driving while under the influence of cannabis by indicating that it’s less dangerous than driving while under the influence of alcohol (25 per cent). This study also revealed that 17 per cent of cannabis users felt that driving while under the influence of cannabis poses no threat at all, and 43 per cent of Canadians don’t know how long to wait after smoking cannabis before driving. It seems as though nobody is really prepared for cannabis legalization. Public knowledge is underdeveloped and law enforcement is unprepared. In less than two weeks, millions of Canadians will be able to spark up legal cannabis, free from the confines of the law. But for cannabis users who plan on driving, this level of confusion is alarming at the least. Comparing cannabis and alcohol has become a familiar trend wherever recreational cannabis use has become legal. This is all fine when it comes to retail distribution and regulations, but when it comes to societal terms, the two drugs could not be more different. We simply cannot treat cannabis like alcohol, especially when it comes to driving. The science just hasn’t caught up with cannabis like it has with alcohol. Alcohol is deeply rooted in human civilization. We’re all too familiar with how it affects us, and how to use it within safe parameters. Cannabis on the other hand is very new to society. It wasn’t long ago that the Canadian government held cannabis on the same level as heroin. Now cannabis is becoming legal across the country and the federal government is playing catch-up. Among all this confusion, one thing is for certain. Absolutely no one has a single clue as to how much cannabis is acceptable to consume before getting behind the wheel. It could be one joint, one puff, or none at all. When it comes to testing drivers for cannabis, saliva testing devices have been the most promising technology available. Saliva testing devices became in legal in Canada with bill C-46, which passed in June. 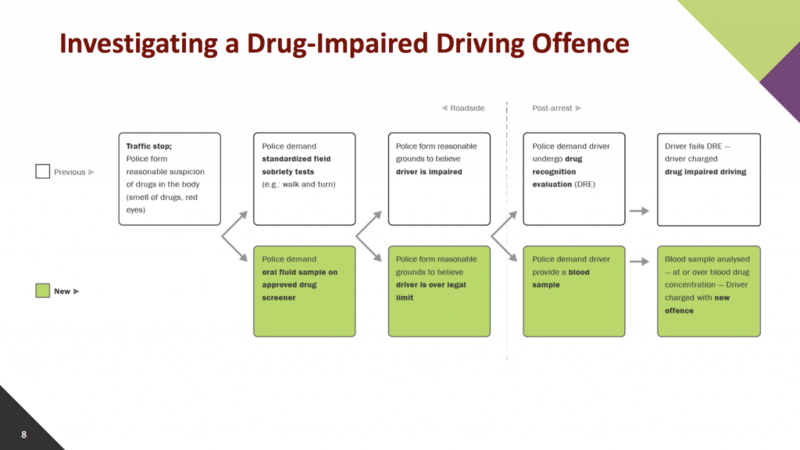 The Liberal government stated that they are an important new tool for cracking down on drug-impaired driving, especially cannabis. These devices have been used effectively and survived court battles in other countries, but Canada is reluctant to use them. The federal government has made it clear that they will be holding off on ordering saliva testing devices. Polices forces in Peel Region, Toronto, Calgary, Edmonton, London, Windsor, and Vancouver have all confirmed that they will not be ordering saliva testing devices at this point in time. Instead of ordering these devices and training police offers to use them, Canada will be relying on roadside sobriety testing for the most part. If you are unfamiliar with roadside sobriety testing, it’s essentially when an officer makes you walk a straight line, stand on one leg, or track an object with your eye. Instead of ordering the only device proven to test saliva for THC, Canadian law enforcement will be reduced to making pot users perform theatre on the side of the road; a strategy which, by itself, is not effective enough for testing cannabis impaired behaviour. While Canada as a whole is holding off on ordering saliva testing technology, small numbers of devices have been ordered in some areas. The RCMP confirmed that they have ordered 20 saliva testing devices from Draeger; named the Draeger DrugTest 5000, it is the only saliva testing device that has been federally approved. While it may sound like a device from a futuristic dystopian alternate universe, Canadian police forces are skeptical about its effectiveness, especially when it comes to colder climates. Ottawa Police Chief Charles Bordeleau told reporters in early September that the major issue with using the Draeger device is keeping the saliva swabs at the right temperature in our Canadian climate. With uncertainty surrounding the effectiveness of the Draeger devices in Canadian weather, defense lawyers will undoubtedly challenge arrests made with these devices in court. “The issue around keeping the swabs at a right temperature is problematic in our current climate,” says Bordeleau. On top of this uncertainty, the Draeger DrugTest 5000 costs a whopping $6,000 a piece. Rightfully so, Canadian police forces are reluctant to order a mass amount of Draeger devices to equip all their cruisers with a device that’s not completely fool-proof. “Once we buy one, we have to equip each police cruiser with one of these devices and that’s not practical at this time,” says Bordeleau.
.@VancouverPD @ChiefPalmer tells @CKNW the VPD are "taking a pass" on the (only) federally approved Drager saliva drug testing machine – saying the department has concerns about it's bulkiness & temperature sensitivity. Starting on Oct. 17, Canadian law enforcement is in for a series of unfortunate events, and defense lawyers are ready to fill their pockets while they hop on any case that has to do with THC and impaired driving. This trend of confusion and unpreparedness goes all the way into the realm of science as well. With the science behind THC testing machinery behind, so is the science between THC blood levels and impairment. The Canadian government has set a “per se” level of THC in the blood within two hours of consuming cannabis. This THC testing system is based on nanograms of THC per millilitre of blood. The problem with this is that the science behind linking blood THC levels is far more inconclusive than the science behind blood alcohol levels. This poses yet another lucrative opportunity for Canadian defense lawyers to challenge cannabis impairment charges in court. On top of these regulations, provinces may add additional penalties based on the severity of the individual case. The government has made it clear that regardless of the lack of valid information, law enforcement will be taking a “zero-tolerance” approach until more solid science is revealed. Ready or not, cannabis impairment charges are coming for Canadian citizens, and nobody is prepared for it. Medical marijuana patients will be the most impacted by these strict laws and inconsistent impairment testing because many of them require high amounts of THC consumption on a daily basis. Naturally, the science behind THC blood levels and saliva testing devices are constantly being improved upon, but not fast enough for legalization. Until the Draeger DrugTest 5000 is proven effective in Canadian climate, recreational and medical cannabis users will be walking, or more appropriately, driving on thin ice when it comes to THC impairment. 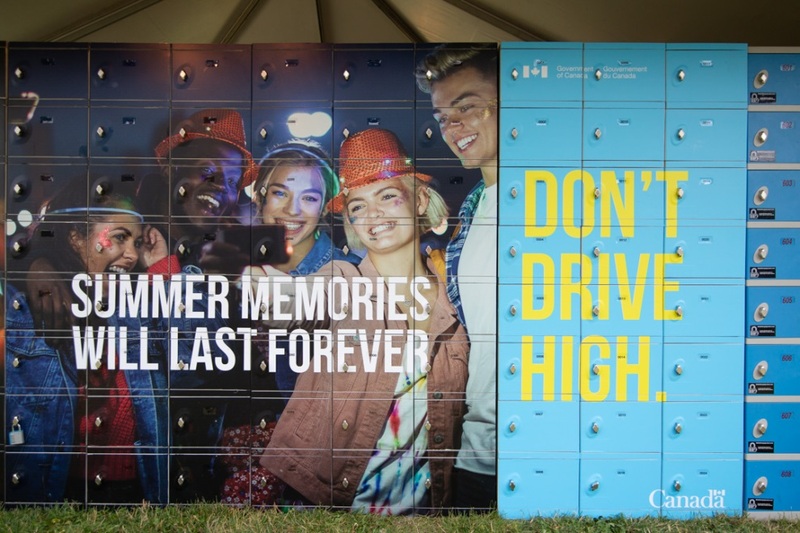 Even though there is very little information proving if and how cannabis effects the ability to operate a motor vehicle safely, the Canadian government has no shortage of frightening propaganda designed to keep the roads free of stoned drivers. This widespread confusion across cannabis experts and government is not through lack of effort or expenditure. Society as a whole is just not prepared for all the implications that comes with federally legal cannabis, especially when it comes to road safety. Several years ago, CNN released an experiment which aimed to test how people drive after smoking cannabis. This experiment tested a heavy user, a moderate user, and a non-cannabis user. Interestingly enough, all three individuals smoked cannabis, and drove safely even after being between four to seven times past the legal limit (5ng). The driving instructor and police officers in the experiment stated that they would not pull these drivers off the road given their interpretation of their driving skills while high. Drivers only began to exhibit un-safe driving after smoking a large amount of cannabis. If nothing else, this small experiment shows that the legal limits for cannabis impairment don’t accurately match the science behind blood THC levels. Yet another example of how little we know about the effects of cannabis on our mind and body. Any reasonable person should understand that cannabis effects the ability to drive safely, but nevertheless, the million-dollar question is how much is too much? The answer has eluded everyone for years, and possibly even years to come. As cannabis-related science is advancing and more information makes its way to the public eye, laws are bound to change, and so will public perception. We can only hope that with the introduction of new information, misinformation stops circulating, and stereotypical propaganda is replaced with reasonable and factual regulations to better integrate cannabis into society. Come legalization on Oct. 17, law enforcement will be cracking down hard on cannabis impaired driving. Zero-tolerance will be fully in effect. Without a reasonable guideline for Canadians to follow when it comes to how much cannabis is safe to consume before driving, and how long to wait before getting behind the wheel, users are left to make an important judgment call. Is one joint okay? One pipe bowl? One puff? From police enforcement and government officials, to cannabis and drug experts, nobody has a clear answer.